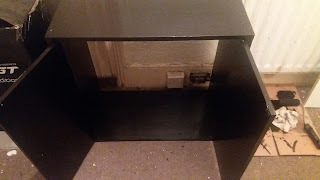 Since first encountering the wonderful world of Bane’s Blog aka Goth It Yourself blog I have always wanted to goth up a piece of furniture. I always loved using her blog as it offers incredible inspiration and practical steps in how to achieve the look. Bane makes me thinks of a Gothic Kirsty Allsop except with the practical diy knowledge. My favourite part has to be how she seems to achieve it all on a lemonade budget using bargain basement shops and a second-hand finds. 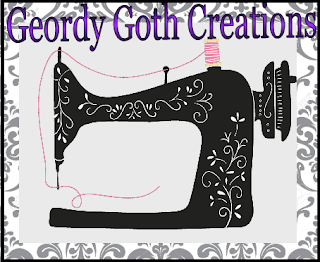 Bane’s blog also offers a unique aspect to blogging on how to create a homemade gothic home. 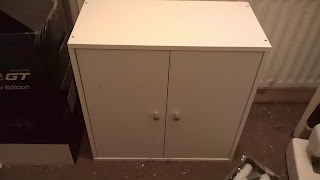 I’ve been searching the shops for a cupboard to store my sewing equipment as it’s been lying around the boyfriends flat. I was surprised to find how expensive cabinets are in the shops. 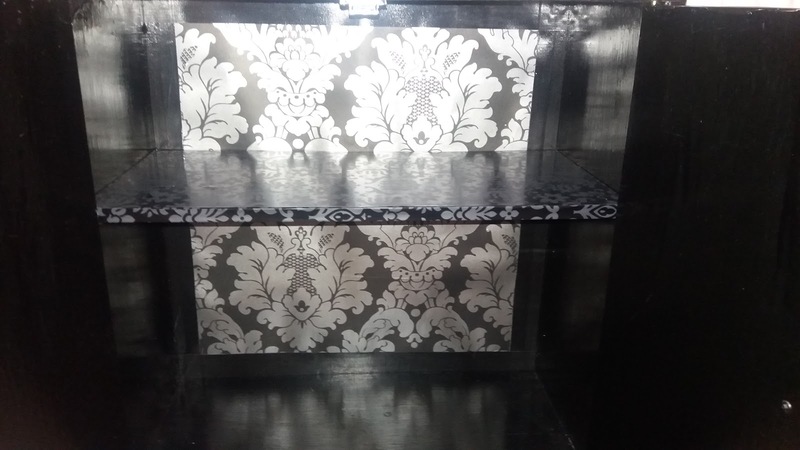 My first furniture revamp an old kitchen cabinet I found on Gumtree for £15, I think it a tad expensive but in comparison to looking around the shops, I still saved money. 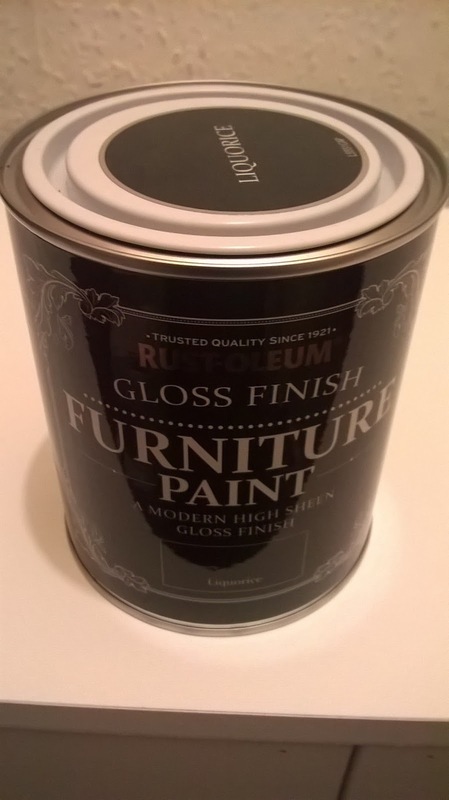 For paint, I purchased Rust-Oleum Gloss Furniture Paint Liquorice black that has a stunning shine, and it was so easy to use. Despite the expensive price tag, the paint is perfect for any novice or lazy crafters as the paint required minimal prep. All I had to do was wash the cupboard down with kitchen cleaner to remove any dirt or grease and left for about ten minutes to dry. I opted for a paint brush; I attempted to use a roller, but I didn’t like the finish. I dipped the paint brush into the paint, removed the excess paint from the brush, and evenly applied the paint on the surface. 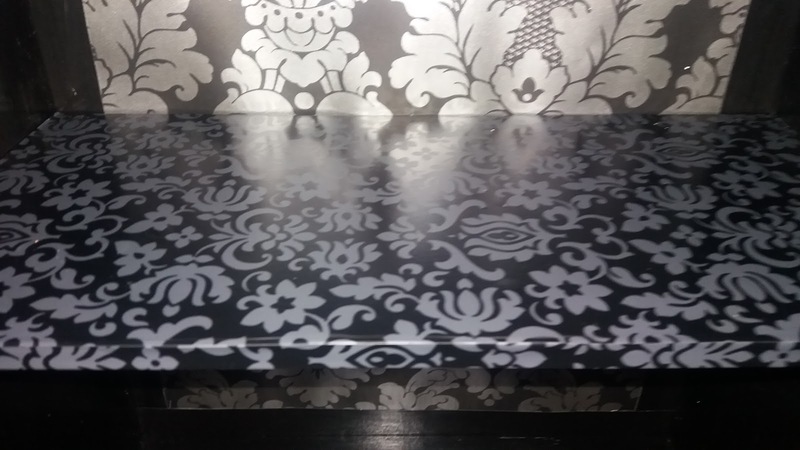 I found the paint went on quite thickly, and it appeared to even itself out when it started to dry it created a rich high gloss work finish that looks fantastic. 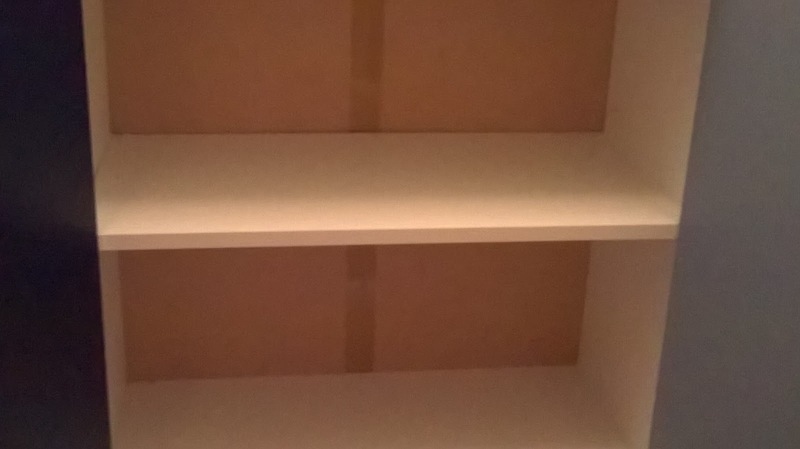 I only used one coat of paint and a light second coat for a touch-up. The paint cost £19.99 from Home Base. 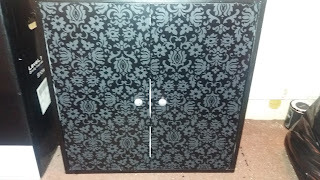 I wanted to create a contrast between the black paint and cabinet's door; I purchased a roll of sticky back plastic from Hobby Crafts for £4. 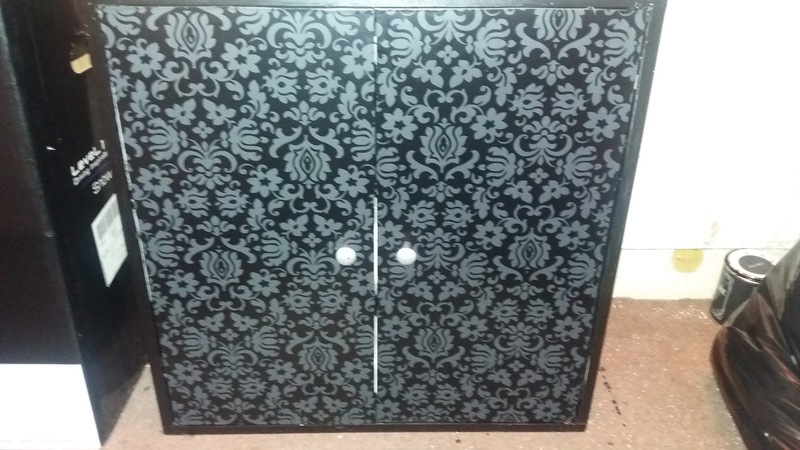 Intended to cover the cabinets cupboard back. However, there were only two metres of backing and the shop had one roll. 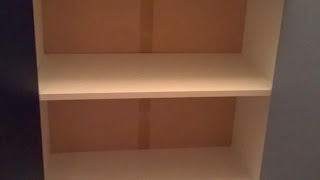 I covered the shelf with leftover backing coordinating the cabinet. 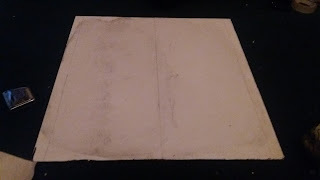 For the back, I removed the ply board backing before painting. 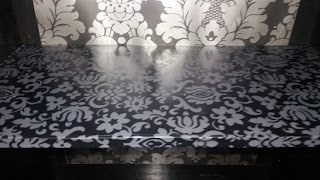 Selected a couple of wallpapers samples from Wilkinson’s I tried them out and chose my favourite. 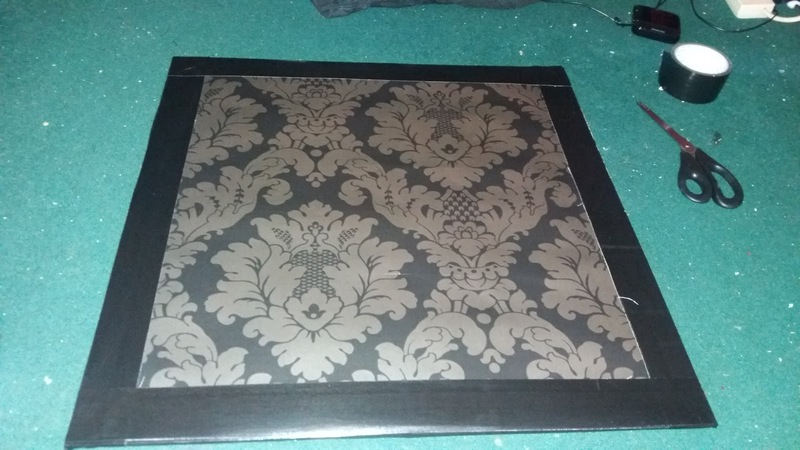 I intended to cover both sides of the board with wallpaper and realised I hadn’t enough, so the boyfriend suggested using duct tape as a border. I measured the width of the board and the wallpaper; I subtracted the difference, divided the difference, and used it as a guide to mark out where to stick the wallpaper. I watched the wallpaper using seller tape and covered the edges using duct tape to neaten the edges I hammered using nails back into the cupboard. For all the materials but I spent about £ 24 for so it was more than the closet I am happy with the final result, and I have a unique piece of furniture that stores all my sewing stuff. I'm happy with the result at least I have something unique.